This will run all the selected tests without further user intervention (the run can be cancelled at any time, of course). 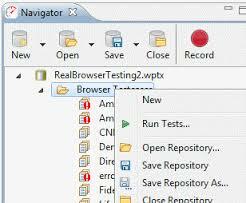 The selection could be all the browser testcases in a specific repository, as shown in the example, or any other selection you can make in the navigator, including tests from multiple repositories. When complete, the result of the tests are updated in the navigator. The red mark added to each testcase in the navigator indicates that the testcase encountered an error. Open the testcase to inspect and diagnose the failure.